Hong Leong Bank Bhd is based primarily in Malaysia with a regional presence in other Southeast Asian countries, Hong Kong, and mainland China. The bank’s strategy emphasizes technology while offering diverse financial products to its Islamic target base. Its services include personal financial services, business and corporate banking, trade finance, treasury, branch and transaction banking, wealth management, investment banking, and Islamic financial services. A majority of the bank’s earning assets are loans, advances, and financing. Net interest income constitutes the bulk of the bank’s income generation. Most of its revenue is derived from personal financial services. Ahead1268 No way HLB can match PBB. BIG Gap, far behind for another decade. Modified: Thursday, 07 December 2017 14:23 Written by James Skinner Subscribe to our Newsletter Follow us on Twiiter This copy is for personal, non-commercial use only. Reproduction of any content for commercial purposes is subject to our usage terms and conditions, please email the editor at his address directly for clarification. A government shutdown in the US looms if lawmakers cannot find agreement - here's a look at what it might mean for the Dollar. The Dollar faces a testing period ahead as lawmakers in Washington turn their attention to the annual debt ceiling debacle which, if unresolved, could see the US government forced to shut down as early as next week. A government shutdown is the process the Executive Branch must enter into when Congress and the President fail to pass emergency legislation to fund government operations and agencies. A temporary extension to the debt limit, agreed in September, is set to expire Friday, 8 December. Extraordinary measures, such as a government shutdown, could enable the Treasury to meet its obligations for several months. Congressional Budget Office staff estimated in November that these measures could see the Treasury through until early April, meaning fears of a technical default by the United States should remain benign until then. A government shutdown is politically contentious as it almost always means the furlough of federal workers. In the December month, right ahead of Christmas, this can be costly for lawmakers who will face mid-term elections in 2018. Wong Wei I don’t understand Hong Leong give dividen so little up so much. Maybank give more up so little. LeeFoundation Now looking actively at Petronm for its low pe high net cash biz. Anything below 13 is still a good and fair valuation for Petronm. 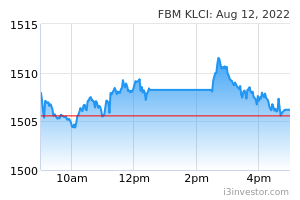 Look at just the fcf alone, smart investors will not easily let this counter go off from their radar. Petron Malaysia Refining and Marketing Berhad (Petron) recorded a full year FY17 net profit of RM341.8m (+44.8% YoY), excluding exceptional items amounting to RM65.6m owing to compulsory divestment of service stations. The lower-than-expected net profit achievement, meeting only 79% of our and consensus 90% full-year estimates, was the result of margin compression following the faster rise in crude oil prices (cost of goods) against product prices (sales). Operating margin halved to 3.7 % in 4QFY17 against 7.8% for the same period a year ago. The company declared RM0.25 dividend per share for FY17 meanwhile, higher than FY16’s of RM0.22, though in line with our expectation. In the short-term, oil price volatility may persist but in the long run, the outlook on oil prices remains sanguine driven by the re-acceleration of global economy. This will be led by the improving prospects of major economies and hence the pickup in industrialization activities, which in turn will underpin the recovery of demand for oil. We remain positive on the prospects of Petron and reaffirm our Outperform target on Petron with a target price of RM13.62, suggesting a potential upside of 13.5%. Higher 4QFY17 revenue (+23.6% YoY) driven by higher global oil prices and volume sold. Global oil prices in 4QFY17, using Brent prices as a benchmark, recorded a 24.4% YoY jump to USD61 per barrel. Petron also registered higher sales volume of 9.1 million (+9.6% YoY) barrels for the quarter, owing to better economic conditions and steady increase in the number of petrol stations. Net profit for 4QFY17 dropped 8.6% YoY to RM101.8m despite the 23.6% increase in revenue. Operating margins took a hit as it dipped to 3.7% in the quarter (4QFY16: 7.8%), no thanks to the faster increase in crude oil prices compared to product prices, leading to compressions. Outlook. Despite the steady rise in oil prices, the company remains vigilant and cognizant of the persistent volatilities resulting from continued imbalances in oil supply and demand. We believe the company will continue to improve their efficiency as a natural defense against this however. Additionally, we foresee the company will continue to leverage on firmer demand as a result of steady economic conditions which underpins their drive to add more petrol stations in the near future. 8. On the radar of Public Invest and RHB Invest. brianklc whn RM20 is coming back? mf 05-Mar-2018	Insider	EMPLOYEES PROVIDENT FUND BOARD (a substantial shareholder) disposed 244,500 shares on 28-Feb-2018. TA would be better from Now! masterus The dollar slumped on Friday, sliding the most against the yen, as traders moved into currencies considered more safe. The move came as U.S. political worries returned, on reports that U.S. President Donald Trump was planning to fire his national security adviser, H.R. McMaster. RedEagle KUALA LUMPUR: The steps taken by the new Pakatan Harapan government to remove political uncertainty, including the setting up of the Council of Eminent Persons, will see more fund flowing into the country. Aberdeen Asset Management Chief Executive Officer Martin Gilbert said the country's economic environment is positive compared with the situation before the recently concluded 14th General Election. "Generally, it is good news. Following the establishment of the council, which includes the former Bank Negara Malaysia governor, both foreign and local fund managers are reassured of a stable economy," he told reporters after the meeting between Tan Sri Zeti Akhtar Aziz and 180 fund managers here today. Gilbert said the meeting was very useful with the world's longest serving central bank governor giving her input on the current economic issues in Malaysia, plans going forward and her role in the council. "With her knowledge of the financial markets, I think this will make global asset managers look more closely at Malaysia going forward," he said. Asked on rating agencies' concern on Malaysia's ability to fill the revenue gap without the Goods and Services Tax, he said these agencies would have to look at the economy as a whole. "The great thing for Malaysia is that all of the (economic) dynamics and growth are good. "However, we will have to wait for the government's plans," he added. masterus Cmsb falling down already. It is the time buy it? Will it fall again. Yunz strong QR.. will it rebound? PETALING JAYA: The government is looking to replace the current currency notes with new ones to combat corruption. Prime Minister Tun Dr Mahathir Mohamad said in an interview with Channel NewsAsia that there could be a change in the currency or go cashless to combat corruption. “It’s not an easy thing because when you want to replace the currency, you must know how much currency is in circulation... because we have to replace what is in circulation and that is a very big amount,” he said. “If you were to replace, you need to print huge amounts of paper money and that is not a decision that one makes lightly. Hidup_Anwar Must find 2-3 banks to close down for burdening rakyat/country. HL Bank 1 of them? King of shorts(IDSS)? Hidup_Anwar If ctrs have sell call good why not close HL Bank even better? 100 bankers jobless vs 100-500K M'sians shareholders sufferer which 1 better? enigmatic Hong Leong bank may overtake Public Bank as the top banking stock in the future. 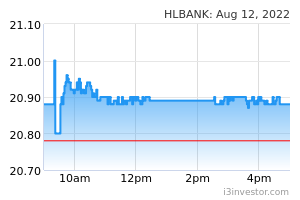 I think HL Bank's superior profit margin means it's more efficient in business compared to its competitors. Will accumulate if it drops below 18.00. Egalelity HLbank, r u ok>? 3iii I think this is the first time this stock price crosses $20. masterus Brent price now at $78 and above. masterus the value of the ringgit against the US dollar has dropped by only 2.2% compared with the Australian dollar, rupiah, yuan, won and Singapore dollar that had weakened by 9.9%, 9.8%, 5.6%, 5.7% and 3% during the same period. Price has risen 47.7% since May 2017. Increasing dividends over the last 5 years. Anti_debt Tax bank profit 50% settle govn debts. ajibkor We made mistake. Should tax bank more. Everybodyhuat Above rm20. Wonder if can go more than PBB. Wong Wei Hmmmmmm I’m thinking !! masterus Lonbisc share price 0.565. NTA 2.07. LouiseS The EPS slightly increase by 9.6% in last 5 years, PE ratio slightly high at 16.6, ROE at 10.48% and dividend yield around 2%.